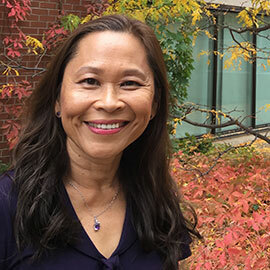 Eleanor Ty is Professor of English at Laurier and writes on novels, memoirs, films, and graphic narratives by contemporary writers. She has published eleven books: on Canadian literature, cultural memory, Asian American and Asian Canadian writing, and 18th century British women novelists. Her chapters and articles engaged with questions of gender, identity, trauma, abjection, digital media, youth, diaspora, and life writing. She is fond of BBC dramas, Netflix shows, and Jane Austen. Her new book, Asianfail: Narratives of Disenchantment and the Model Minority (2017) looks at how a new generation of Asian Americans and Asian Canadians struggle with the expectations, work ethic and self-sacrifice of their parents. Rejecting an ethos obsessed with professional status and accruing money, the protagonists of recent narratives are disenchanted with their lives and seek fulfillment by prioritizing relationships, personal growth, and cultural success, questioning outmoded notions of the "model minority." It was awarded best adult non-fiction book for 2017 by APALA: Asian Pacific American Librarians Association. Professor Ty has been awarded a Fulbright Canada Visiting Research Chair for 2018-2019 at the Department of Asian American Studies, University of California Santa Barbara. She will be conducting research on contemporary Asian North American Literature and teaching a course on Asian American Graphic novels in winter term. Ty was awarded Laurier's University Research Professor in 2015. The recipient of four Social Sciences and Humanities Research Council research grants and two SSHRC conference grants, she has been a visiting professor at Universität Trier, Philipps-Universität Marburg and the University of Saarland, Saarbrücken in Germany. In 2017 she served as Program Co-Chair for the Association for Asian American Studies (Portland 2017); has served as Academic Co-Convenor of Congress 2012; Chair of the Department of English and Film Studies from 2004-2009; Graduate Officer for the Department of English, 2000-2003; Women’s Studies Program Coordinator, 2000-2003; and President of the Canadian Association of Chairs of English from 2008-2009. Ty's undergraduate courses include Enriched Literary Studies, Growing Up Canadian, Life Writing and Digital Media, Globality and 21st Century Narratives, Contemporary British Novels, 18th Century Literature, The Monsters We Imagine, Reading Fiction, Diasporic Cinema, Literary Theory, The Novel After 1900, Asian Canadian Literature, Survey of Major British Authors. Her graduate seminars include The Graphic Novel, Canadian Literary Pluralities, Asian American Narratives. My recent research has focused on Asian Americans and Asian Canadians and the ways their narratives (novels, films, memoirs) represent their diasporic identities. Some of the topics I have worked on include memory, invisibility, globalization, second-generation immigrants and failure. Before 2000, I worked on late 19th-century British women writers such as Mary Wollstonecraft, Mary Hays, Amelia Opie, Elizabeth Inchbald and others. I looked at how these female authors used the sentimental novel to recast stereotypes of the feminine – the seduced woman, the passive wife, or the obedient daughter — and how their novels empower women. I have published 11 books to date (5 monographs and 6 edited volumes). ﻿Asianfail﻿ was awarded best Adult non-fiction book for 2017 by APALA: Asian/Pacific American Librarians Association. Selected as University Research Professor for 2015-2016, Wilfrid Laurier University. Awarded Conference Grant for “Memory Mediation, Remediation” in 2011 with Russell Kilbourn. Awarded Social Sciences and Humanities Research Council Research Grant for “Second Generation Asian North American Narratives” in 2010. Honorable Mention, Literature Book Award for Asian Canadian Writing Beyond Autoethnography, co-edited with Christl Verduyn, from the Association for Asian American Studies in 2008. Awarded Social Sciences and Humanities Research Council Conference Grant for “Beyond Autoethnography: Writing Race and Ethnicity in Canada” in 2005, organized with Christl Verduyn. Awarded Social Sciences and Humanities Research Council Research Grant for “Beyond Autoethnography” in 2004. Awarded Social Sciences and Humanities Research Council Research Grant for “Representations of Asian North American Subjectivity” in 2000. Aid To Scholarly Publications Grant – 2008, 2004, 1998, 1993. I have research assistantship opportunities for undergraduate and graduate students interested in contemporary ethnic American and Canadian literature and culture. In the past, I have hired student assistants to help me with organizing conferences, editing and proofreading book manuscripts, and compiling bibliographies. Contact me for more information. I am willing to supervise graduate students in 20th-century and contemporary literature and culture, especially those focusing on questions of ethnicity, gender, race, life writing, popular genres, memory and identity. In addition, 18th-century British literature, especially fiction by women, remains an area of interest for me. Asianfail: Narratives of Disenchantment and the Model Minority. Champaign: University of Illinois Press, 2017. xii+160 pp. Unfastened: Globality and Asian North American Narratives. Minneapolis: University of Minnesota Press, 2010. xxxvii + 175 pp. The Politics of the Visible in Asian North American Narratives. Toronto: University of Toronto Press, 2004. xv + 227 pp. Empowering the Feminine: The Narratives of Mary Robinson, Jane West, and Amelia Opie, 1796-1812. Toronto: University of Toronto Press, 1998. xi + 224 pp. Unsex'd Revolutionaries: Five Women Novelists of the 1790s. Theory and Culture Series. Toronto: University of Toronto Press, 1993. xvii + 189 pp. Co-editor, Cynthia Sugars. Canadian Literature and Cultural Memory. Toronto: Oxford University Press, 2014. 512 pp. Co-editor, Russell Kilbourn. The Memory Effect: The Remediation of Memory in Literature and Film. Waterloo: Wilfrid Laurier University Press, 2013. 355 pp. Co-editor, Christl Verduyn. Asian Canadian Writing Beyond Autoethnography. Waterloo, ON: Wilfrid Laurier University Press, 2008. 330 pp. Co-editor, Donald Goellnicht. Asian North American Identities Beyond the Hyphen. Bloomington: Indiana University Press, 2004. 212 pp. Editor. Memoirs of Emma Courtney by Mary Hays (1796). Oxford: Oxford World's Classics, 1996. xlv + 220 pp. 2nd ed., 2000. xlv +220 pp. Reissued 2009. Editor. The Victim of Prejudice by Mary Hays (1799). Peterborough and Lewiston, N.Y.: Broadview Press, 1994. xxxviii + 198pp. 2nd ed., 1998. xliii +260 pp. Winter term: On research leave. Please e-mail.